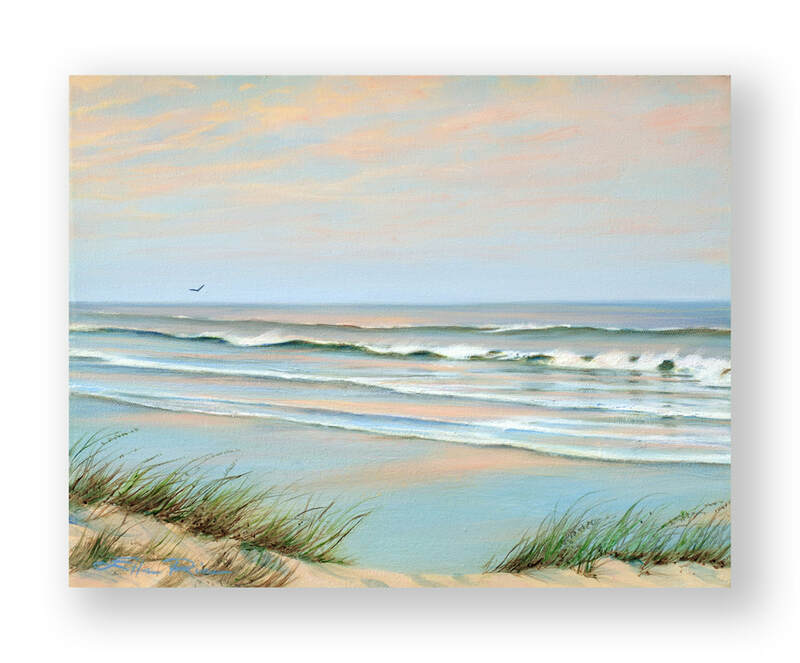 Surf's up on the north side of Indian River Inlet in this little painting by the same name. Set after set of waves is rolling in with no chop, an ideal setup for catching some long rides. It's dusk and the color of both water and sky are changing with the angle of the sun as it begins to sink lower in the sky on the far side of the dunes. Those dunes are where my son and I used to camp out back in the early 1970s watching my husband and his best friend catch the waves on their longboards. This oil is painted from memory. The view hasn't been the same since the new Indian River Inlet Bridge was constructed and steel girders were interlaced in a long straight line to hold dunes in place after the state methodically killed off the pine trees that had done that same job well for many decades. It turned out that they weren't indigenous, since the US Army Corps of Engineers had planted them to hold the bridge and road in place.... Ah, the wisdom of government. This stretch of beach laid out in Surf's Up is a favorite of local surfers, who call it "The Cove"​​. By clicking the link, you'll be taken to another painting I've done of the same place but from the perspective of the surf. It's one of my favorites. There's another name applied to this section of beach, "Coin Beach." Imagine if you will that beneath the smooth waves on the left side of the painting still lies a 1700s shipwreck that when storms come along still releases some of its treasures, copper coins and other artifacts from nearly two centuries ago. I've spent countless days walking this beach in search of artifacts from The Faithful Steward. If you stop in my bricks and mortar gallery either I or my manager, Duane, will be glad to show you a few shipwreck coins found there. You can read more about the treasures that wash up on the Delaware Coast by clicking on ​​Treasure Beaches of the Mid-Atlantic and Treasure Legends of the Mid-Atlantic. Have fun exploring The Cove.